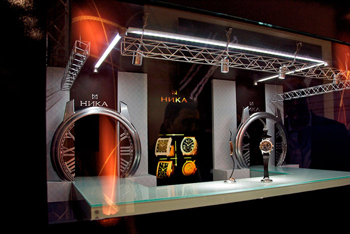 Like real models at fashion shows, brand watches NIKA will defile the gathering at a peculiar mini catwalk. 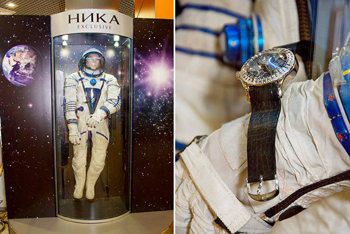 Attract the attention of visitors to the stand mannequin astronaut human growth in a glass capsule – he seemed to float in space, and with it floats in zero gravity model Skeleton watches collection from Nick Universe Exclusive. Each model brand Exclusive Nika shows wealth of techniques in the arsenal of watchmakers and jewelers. It gives a rich and artistic possibilities of hot, cold and light-curing enamel, elegance and virtuosity of the metal case, the dial and the mechanism. Over the past six months, was created about 40 works of various subjects: space, love, animals, cities, and sports, historical, mythological and biblical subjects. The exhibition in St. Petersburg Nika Exclusive Present New with interesting engineering solution: a small Swiss movement cleverly installed a large (4.5 mm) stone – sapphire, ruby or diamond (depending on model). Partners and wholesale customers will be invited to try out the new interactive format work, followed by “Jewelry supermarket.” It has become a tradition for the guests stand NIKI open door VIP-hall, where you can eat, drink a cup of invigorating coffee, leave personal belongings in an individual cell, the use of personal computers connected to the Internet and view the latest trade press.